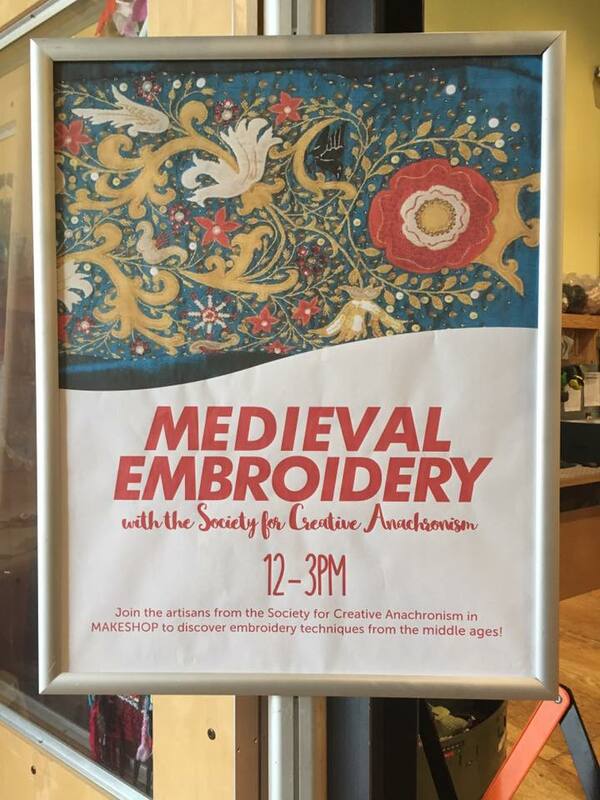 The BMDL Fiber Guild was invited back to the Children’s Museum of Pittsburgh MAKESHOP on April 29, for a medieval embroidery demo. (This is our sixth demo for the museum!) MAKESHOP is a partnership between the Children’s Museum of Pittsburgh, Carnegie Mellon’s Entertainment Technology Center (ETC) and the University of Pittsburgh Center for Learning in Out-of-School Environments (UPCLOSE). It is a space dedicated to making, reusing and designing things, using everyday materials and real tools. It has regular programs and special guests. 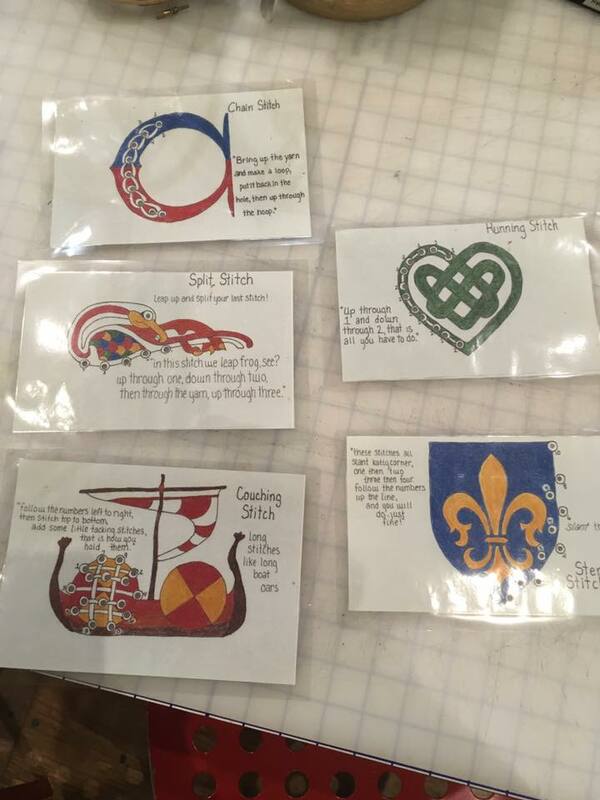 The goal of the demo was to introduce children and their families to medieval embroidery and basic techniques. As it can be a complex topic, there was a lot of fine tuning to make sure the program would be useful to the children who have never done any embroidery and to the more experienced adults. This required the talent and resources of many people to produce a successful presentation. 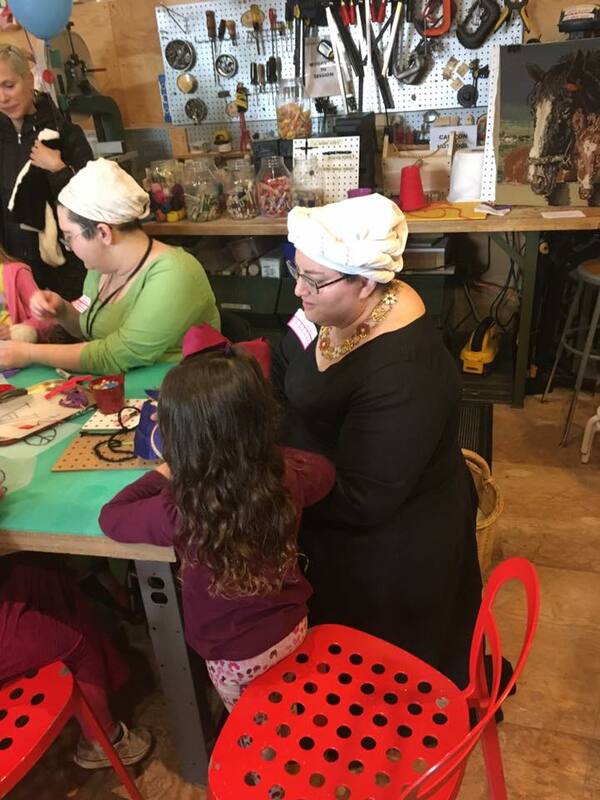 Mistress Ts’vee’a bat Tseepora Levi, Lady Gesa von Wellenstein, and Lady Rivka bat Daniyal generously donated their time and skills to the demo by teaching the stitches, drawing designs, and assisting with the kids’ take home projects. Lady Rivka and Mistress Tsvia demonstrating skills to the children. THL Renata Rouge sent us her embroidery stitch cards, which guided the kids through commonly used stitches using a “connect the dots” method (and the cards rhymed, too). They were so successful, that after the demo the Museum requested to keep a set. Mistress Rowena ni Dhonnchaidh of Coppertree donated a big box of embroidery floss, and we used a lot of it! Embroidery stitch cards from THL Renata Rouge. We also had a wonderful display of medieval embroidered items – the Baron and Baroness of the Debatable Lands Hilda and Brandubh loaned their embroidered heraldic hoods, Mistress Antoinette de la Croix lent us two amazing embroidered dresses, Mistress Tsvia brought her Elizabethan blackwork embroidery, Lady Gesa brought several traditional embroidery items, and Lady Rivka submitted her embroidered Ottoman Turkish coat. 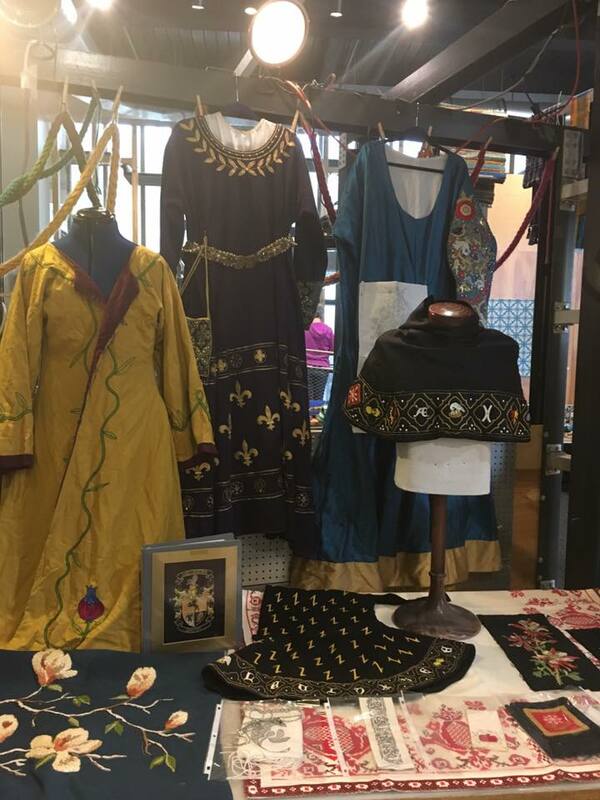 Children and adults enjoyed the display, took home the embroidered designs they made, and learned about the use of embroidery in the Middle Ages. Great fun was had by the attendees and the demonstrators! We are looking forward to the next demo in the fall. Photographs taken and article submitted by THL Luceta di Cosimo.